Get dinner on the table in minutes with these super quick, flavorful Creamy Salsa Chicken Burritos! I shared these burritos over at Chef In Training just after she had her baby boy. They’re the perfect dinner for a new mom, or just a busy mom, which I’m pretty sure is all of us! Or just for anyone looking for a super quick dinner. These only take 10-15 minutes to throw together! Shredded rotisserie chicken, Greek yogurt, salsa (of your choice), and black beans, make a super creamy, flavorful chicken filling to stuff inside a warm tortilla. Roll them up with a little brown rice, lettuce, and cheese and you’ve got a great tasting burrito! The Greek yogurt makes the filling especially creamy, and I promise, no one will know you used Greek yogurt! Make these as mild or as spicy as you’d like with the type of salsa you use! creamy salsa chicken burritos that are lightened up and quick to make! In a saucepan, whisk Greek yogurt, salsa, cumin, garlic, and salt and pepper together over medium heat. Stir in shredded chicken, black beans, and 1/2 cup of shredded cheese. Cook over medium heat until cheese is melted and mixture is hot. Warm flour tortillas in the microwave or on a griddle. Divide creamy chicken mixture among tortillas. Top with a heaping spoonful of brown rice, chopped lettuce, and a sprinkle of shredded cheese. Roll up burritos and serve. I LOVE the new look, Kristy!! 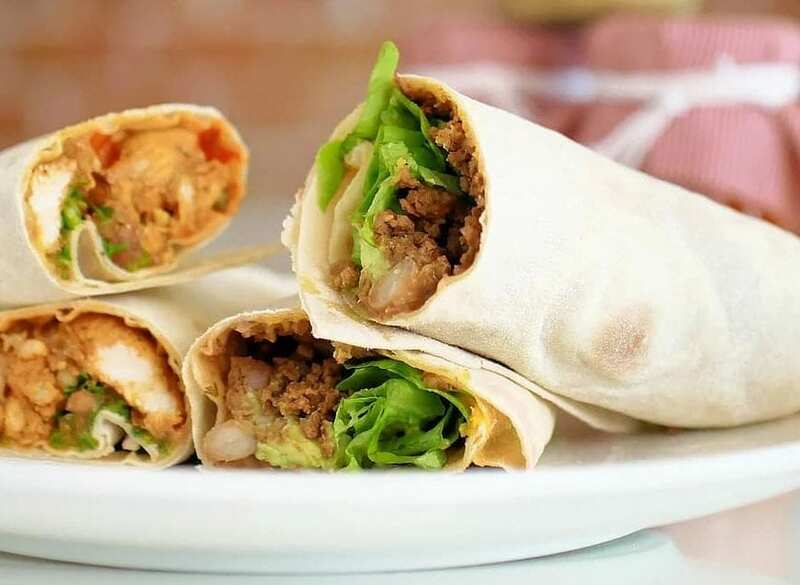 And these burritos look killer – definitely something we’d devour!